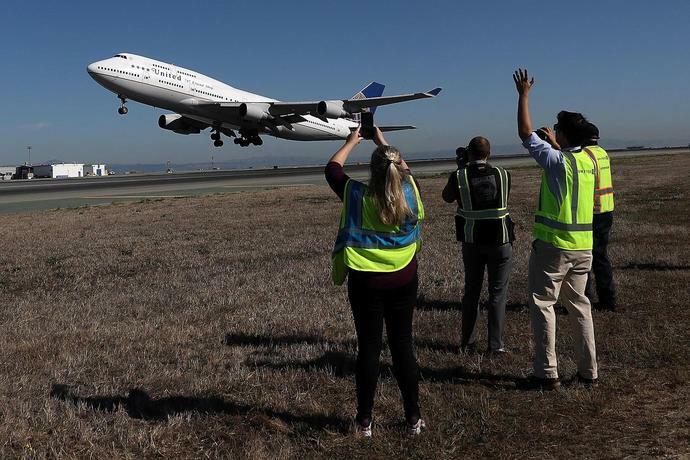 (Bloomberg) -- The world got its first glimpse of Boeing Co.'s 747 jumbo jet in flight half a century ago, on Feb. 9, 1969, as it soared into the sky above a throng of onlookers and the Everett, Washington, factory created to bring it to life. Ever since, people have not stopped gawking at the iconic humpbacked aircraft, whose stately lines resemble those of a cruise ship. The first test-flight aircraft, RA001, was more than double the size of Boeing's next largest commercial jet at the time. The jet's pilots sat in a cockpit three stories off the ground. It was brought to life from drawings in just two-and-a-half years, by a team led by Joe Sutter, Boeing's fiery tempered chief engineer. The design defied the wishes of launch customer PanAm and the cost almost bankrupted Boeing. Still, the 747 shrank the globe, introduced concepts and technologies that forever changed long-distance travel, from twin aisles to inflight entertainment. Boeing went on to sell 1,572 of the jets as the jumbo was redesigned and updated over the decades. While twin-engine jets like Boeing's 777 and later the Airbus A350 have mostly replaced jumbos on long distance passenger routes, air freight haulers are still buying a cargo version of the 747. Crowds of people gathered to see the 747 roll out of the factory for the first time on Sept. 30, 1968 (above), with Boeing saying some 50,000 people had worked on bringing it to life - from construction workers, engineers and mechanics, to secretaries and administrators. The team was dubbed "The Incredibles." The aircraft was launched with a handshake agreement between the CEOs of Boeing and PanAm, in anticipation of a surge in passenger traffic and increasingly crowded skies. Convinced that passenger travel would soon migrate to supersonic jets, Sutter's team designed the jet with a second purpose in mind - transporting oversize cargo. They shifted the cockpit back so that cargo pallets could be loaded through a hinged nose that flips open - and created the 747's iconic hump. Jack Waddell, Boeing's then chief test pilot, helmed the first flight on Feb. 9, 1969. It was a sight to behold. The fuselage of the airplane was 225 feet long and the tail was six-stories high. The cargo hold had room for 3,400 pieces of baggage and could be unloaded in seven minutes, according to the planemaker. The total wing area was larger than a basketball court, while the entire global navigation system weighed less than a modern laptop computer.Sutter, in his autobiography, "747," described a moment of truth as the jumbo prepared for its first landing after an hour-and-a-quarter aloft. Some so-called experts had contended the aircraft was too big to bring safely back to earth. But to Sutter's relief, RA001 descended "with the stately majesty of an ocean liner," flaring gently before touching down smoothly. "All my worries evaporated and I knew we had a good airplane," he wrote. But the plane wasn't the one PanAm had in mind when it placed the order. Juan Trippe, the airline's founder, had envisioned an aerial ocean liner - a double-decker, single-aisle aircraft seating 400 people. To Sutter, Trippe's single-aisle concept was doomed for safety reasons. The engineer held out and eventually won Pan Am over to his twin-aisle design, then a novelty but now a standard in long-haul jets. PanAm's inaugural 747 flight for paying passengers, from New York to London, was preceded by much drama. The service, originally scheduled to depart in the evening of Jan. 21, 1970, was delayed after an engine flamed out. A back-up 747 aircraft was called in, which eventually took off almost two hours past midnight, securing its place in the history books with a landing in London on January 22. Film technicians at Pinewood Studios set up a miniature air crash sequence for the Jack Gold film "The Medusa Touch," on August 9, 1977, using scale models of a Boeing 747 and a skyscraper. Lufthansa uses Volkswagen Beetle cars to demonstrate the loading capacity of its Boeing 747 F - Jumbo Freighter, in 1972. While the appeal of four-engine jets like the 747 is fading for passenger travel, the aircraft is still going strong for cargo carriers. A pedestrian crosses a road in Kowloon underneath the flight path of Hong Kong's Kai Tak International Airport, as a Boeing 747 prepares to land on March 3, 1998. A 747-400 - the most successful version of the aircraft, which was built with advice from customers including British Airways, Cathay Pacific, KLM and Lufthansa - comes in to land at Princess Juliana International Airport on the Caribbean island of Saint Martin in July 2002. Boeing built 694 of the aircraft, which featured a glass cockpit - instruments displayed on LCD screens which eliminated the need for a flight engineer. It was the last aircraft to be shaped by Sutter before he retired. It wasn't just NASA that chose the 747 to transport valuable cargo. In the mid-1980s the Reagan administration ordered two 747s to replace the aging 707s that had been used to transport the President of the United States. George H. W. Bush (left, exiting the plane with wife Barbara in Moscow, 1991) was the first president to benefit from the new Air Force One. Top right, Barack Obama confers with aides on board Air Force One in November 2009. Bottom right, Donald Trump speaks to the press on board, in April 2017. 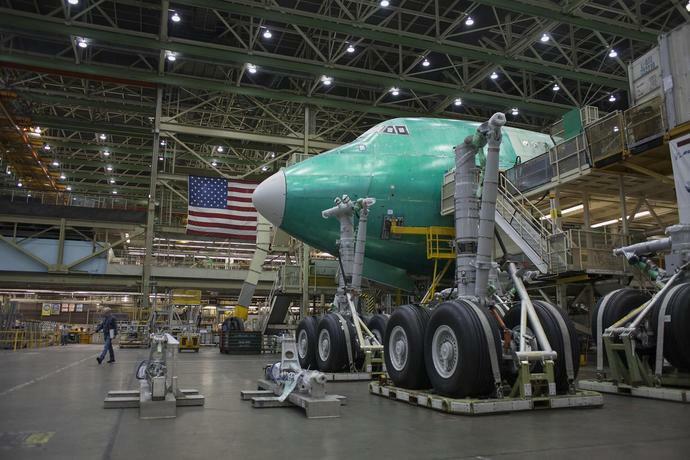 The Boeing 747-8, the latest model of the U.S. plane manufacturer's jumbo jet, being built at the company's plant near Seattle, Washington, on March 31, 2014. Boeing's latest version of the jet, the 747-8, was given an engine overhaul and new wings, at the urging of Lufthansa and Sutter, who despite retirement remained a Boeing adviser into his 90s. The upgrade proved costly as design changes and an engineering shortage caused by the tardy Dreamliner left the 747 years behind schedule. Top, wind-tunnel testing in 2006. 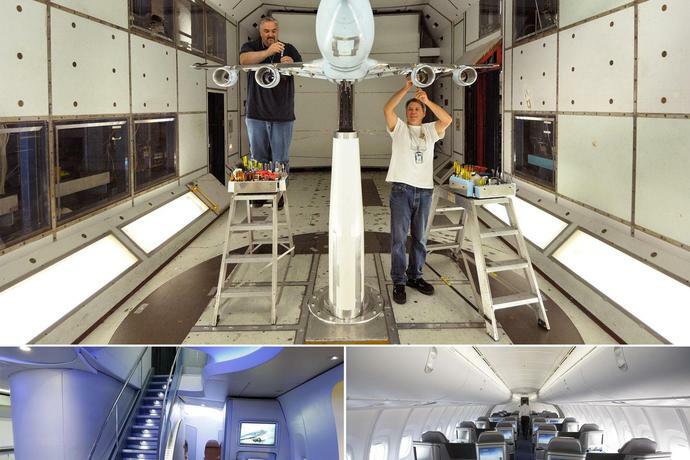 Bottom left, a stairway to the upper cabin of the Boeing 747-8 shown in a mock-up of the interior at the Boeing Customer Experience Center in Renton, Washington in 2011. Bottom right, Lufthansa's 747-8 business class cabin in 2014. United Airlines' last 747 flight, from San Francisco International Airport to Honolulu, on November 7, 2017. With the development of fuel efficient aircraft such as the Boeing 777-300ER and Airbus A350, the affectionately named "Queen of the Skies" is losing its charm as a passenger plane. United Airlines had been flying 747s since 1970. As for the retired 747s not lucky enough to be reborn as cargo carriers, the graveyard beckons. At a vast storage facility in California's Sonoran Desert, the remains of once-majestic carriers litter the landscape. Here, the fate of the world's retired civil airliners is decided by age or a cooling economy. They will either be cannibalized for working parts or sliced up by giant guillotines and recycled for scrap. The total number of permanently retired or scrapped Boeing jumbos has more than doubled, from 442 in 2010 to 890 as of 2018, according to a Bloomberg Intelligence analysis of Flight Ascend data.